The Perkins family poses with some of their pooches during a holiday gathering. When choosing the best dog breed for your family, answering a few simple questions can help steer you in the right direction. What are the ages of your children? What size home and yard space do you have? And, finally, how energetic and active are you as a family? Answering these three questions helps you choose a dog with the energy level, exercise needs, and temperament that best suit your family’s lifestyle. A laid-back dog who stays calm in the midst of pandemonium, for example, is a wise choice for families with young children. If square footage is limited in your home and yard, a medium or small dog is a better choice. You can also learn which dogs are most family friendly from those who’ve added furry four-legged friends to theirs. Playful, gentle, and affectionate dog breeds always rise to the top among highly recommended family dogs. Here’s our list of the top dog breeds for families with children from tots to teens. Labs are a consistently beloved breed among couples, singles, and families alike. Their widespread popularity stems from their noble good looks, and their easygoing, lovable and playful personalities. Labrador Retrievers are also highly intelligent, which makes them easy to train. This is a prized trait for busy parents who don’t have the bandwidth for lengthy training sessions with stubborn dogs. Labs usually don’t mind time alone, so they adapt well to the frequent comings and goings of busy families. With a cozy dog crate or dog bed, and some dog toys handy, your Labrador Retriever isn’t likely to fuss when you head out for school drop-off, birthday parties, or swim lessons. This sporting breed is best matched with active families who’ll take their dog outdoors for frequent exercise and play sessions. Labs are eager companions for swimming, hiking, and running. And as a bonus, your children will be happy to run around the back yard for hours on end playing catch with their canine sibling. Photo by Andrew Dunn, under the Creative Commons Attribution-Share Alike 2.0 Generic license. Expect lots of gamboling and cavorting in the yard when you welcome an Old English Sheepdog into your world. The OES has a silly side that kids adore, and his shaggy mop of a coat only exaggerates this trait. Be wary of fur growing long enough to cover your Old English Sheepdog’s eyes, because kids will push it back constantly and may accidentally injure him. Keep the hair trimmed or tied in a top knot. As their name suggests, Old English Sheepdogs are herders, known for nudging wayward toddlers back to the family fold. And, if your children don’t mind them, they may resort to barking to make sure their orders are received loud and clear. Your neighbors will get the message too, because the OES has a distinctive ‘pot-casse’ bark that sounds like two pots banging together. The wholly loving and sociable Golden Retriever makes a wonderful family dog. 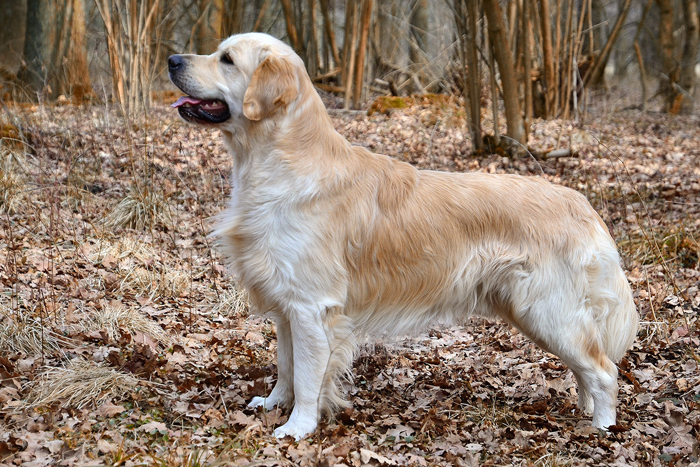 Similar in temperament to Labrador Retrievers, Goldens are distinguished by their luxurious long coat and somewhat sensitive temperament. These dogs require plenty of positive reinforcement during obedience training, and may develop separation anxiety when apart from their beloved people for too long. Just like kids, Goldens thrive with love, attention, and gentle guidance. When well trained, they are patient and playful with children. Taking walks through the neighborhood with your Golden and romping with him in the back yard will become a cherished part of your family’s daily routine. Photo by Flickr user DanDee Shots, licensed under the Creative Commons Attribution 2.0 Generic license. Though you should never leave your tykes alone with a Newfoundland, this ‘nanny dog’ is a thoroughly gentle, protective, and loving family dog. Teach your kids not to climb on your Newfie’s back, or roughhouse carelessly with him. This breed is so unflappable he won’t protest and may be injured accidentally. If you are a highly active family—always ready for runs or long hikes—this may not be the right breed. Newfoundlands need regular exercise, but they also like to kick back and relax. A long walk and a few gallops across the yard each day will give him all the exercise he needs. Take special care with your Newfie in warm weather, as he is prone to heat exhaustion because of his thick coat, and needs an air-conditioned room when temps spike. 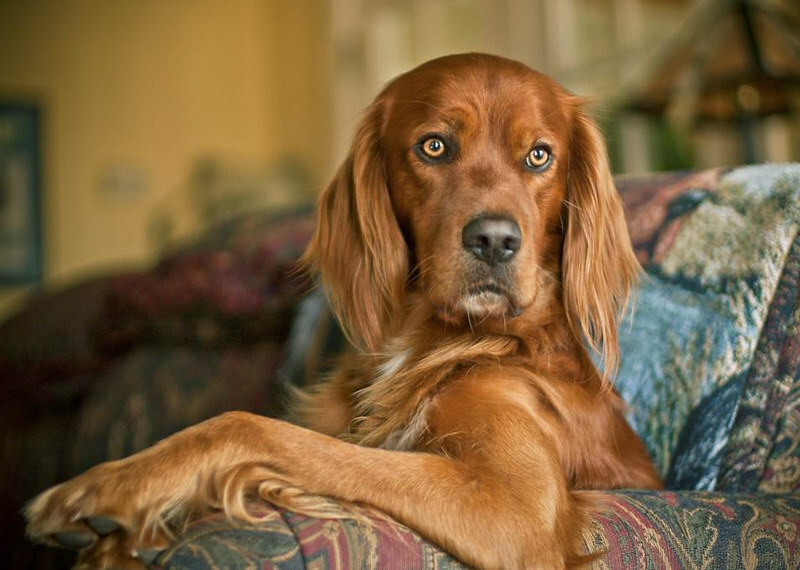 The stunning Irish Setter looks glamorous with his shiny, mahogany red coat, but his favorite activities are mucking about and going on adventures. And all the better if he’s got two-legged playmates to join in on the fun. Irish Setters are endlessly exuberant and gregarious. They greet all with a warm welcome and hearty tail wagging. Because their boisterousness knows no bounds, be sure to watch closely when playtime involves little kids. Though fast learners, Irish Setters are a bit more sensitive than other breeds, and require a soft approach and abundant praise during obedience training. Requiring an hour and more of vigorous exercise every day, Irish Setters are best matched with sporty families. They make excellent running partners, and are eager participants in games of fetch and agility training. Only experienced dog families should consider this charming, but strong-willed sporting breed. Those with the time and patience for thorough obedience training are rewarded with a winning companion. Nova Scotia Duck Tolling Retrievers—Tollers for short—are loving, energetic, and raring to participate in any family adventure. Their lively spirit and athletic build make them better suited for families with tweens and teens—this rambunctious dog may accidentally knock over toddlers and elementary school-age kids. Tollers need an abundance of exercise. Have every member of your family commit to taking him out each day for runs, hikes, walks, agility training, or games of fetch, and he should get enough activity. Though he has sporting dog roots, the cheerful Cocker Spaniel has the heart of a companion dog. Cocker Spaniels are a charming mix of gentle and playful—they have a calm demeanor but are also game for adventure. For these reasons, the Cocker is a popular therapy and emotional support breed. Cockers who’ve been raised with children tend to make excellent siblings. It’s smart to have one in your life before you have kids, or make sure you adopt a Cocker who displays no shyness or fear aggression around children. One of the lowest energy sporting dogs, the Cocker is an excellent option for families with smaller yards and without endless free time for trips to the dog park. Several games of fetch in the yard and a few long walks each day will give your Cocker Spaniel the exercise he needs. To further fine-tune your choice, visit our Dog Breed Selector. And, finally, a shout out to the possibility of adopting a rescue. You may even meet a loving, good-humored mix at the shelter who combines one or more of the above breeds. Whichever way you go, expanding your household by a furry best friend (or two) is sure to rank high among your family’s fondest experiences. 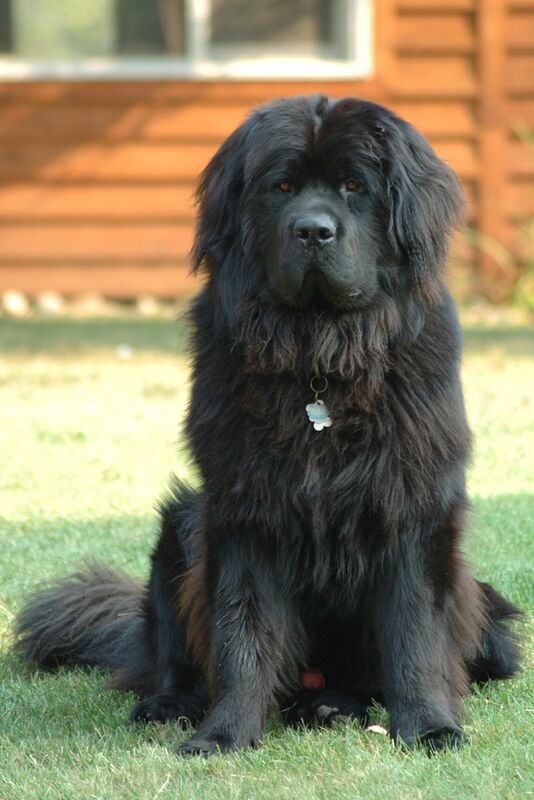 While the Old English & Newfoundland are great pets, they have “excessive” grooming, brushing, etc. All the time. The Lab & Goldens require a lot of exercise. A great breed for families with children are: Clumber Spaniels, Field Spaniels & English Cockers.